This breed of dog was developed in the 17 century as a successor of the puli. This dog breed was created to protect sheep and other small animals, they are the choice of farmer and are rare in north America. The most important feature in the pumi dog breed which makes them different from other dogs are their hardy and sturdy attitude. They are good watchdog and have a habit of barking every time, which make them a good watchdog. This breed is agile and energetic, they are a very cheerful breed and are comfortable with family, they are suspicious of strangers and this habit gives them a good standing among the watchdog breeds. They are good with children and older people, they are alert and energetic, they are sensitive with their masters and become bored if they are left alone, the Pumi dog breed become aggressive if lonely for long periods of time. 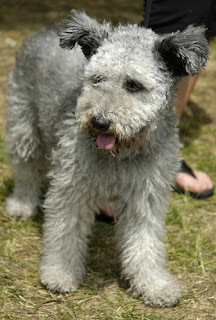 The Pumi's double coat is of average length, thick, and curly. The undercoat is soft, but not velvety. The outer coat is harsh in texture. This breed sheds little to no hair. they are good learners and need early socialization. They do not respond to harsh and hard methods of training, dog training should be given to them with fairness and patience. This breed is good for apartments. They need weekly cleaning of their coat, bathing should be given to them its require. Due to the rarity of this breed and limited intervention by humans, the Pumi has no known health issues. Their average life span is between 12-13 years. The most recently developed of the Hungarian sheepdog breeds. General appearance: medium-sized, square-built with shaggy coat, ears with drooping tips, docked tail. Head: longish, crown domed, rather narrow, stop hardly perceptible, scissors bite. Nose longish and pointed, eyes dark, ears set high, held erect with drooping tips, medium-sized. Neck: moderately long, slightly arched, muscular. Body: withers long, back and loins short and well coupled, rump slightly sloping, brisket deep and long. Legs and feet: forelegs straight, vertical, rather far apart, hind legs set fairly far forward. Feet firm and compact. Tail: set high, curled over hind quarters and docked if not born with stump of tail. Coat: moderately long, shaggy but not felted, leaving eyes and muzzle free. Color: all shades of grey, black, white and rusty brown. Height and Weight: 35 – 45 cm, 8 – 13 kg. Origin of breed: crossing of domestic breeds probably with Pomeranian Spitz. Characteristics and uses: intelligent, modest, persistent, zealous in carrying out work entrusted to it, affectionate and devoted to its master. Satisfactory herding dog.